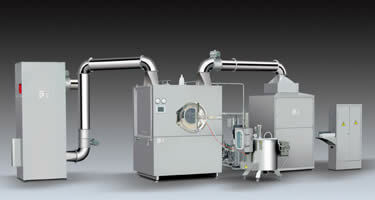 Compared with pharmaceutical coating machine, high efficiency film coating machine has WIP online cleaning system. To be more specific, nozzles are placed in different parts of the main machine for online cleaning. Besides that, independent cleaning liquid booster distribution can be configured, thus pressure of cleaning liquid from every spray header can reach 0.6 Mpa. At the same time, coating machine can be washed effectively. 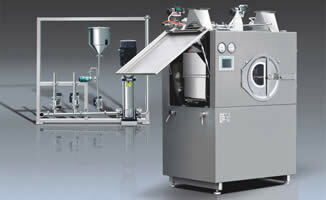 This machine can configure cycle cleaning and drainage systems with different choices. Controlled by PLC, residual water of each nozzle can be dried by compressed air, thus implementing fully automatic washing and drying procedure. Feiyun is a China-based high efficiency film coating machine manufacturer and supplier. We provide various types of products such as emulsifying mixer, PTP aluminum foil blister packing machine and automatic pharmaceutical capsule filler machine.